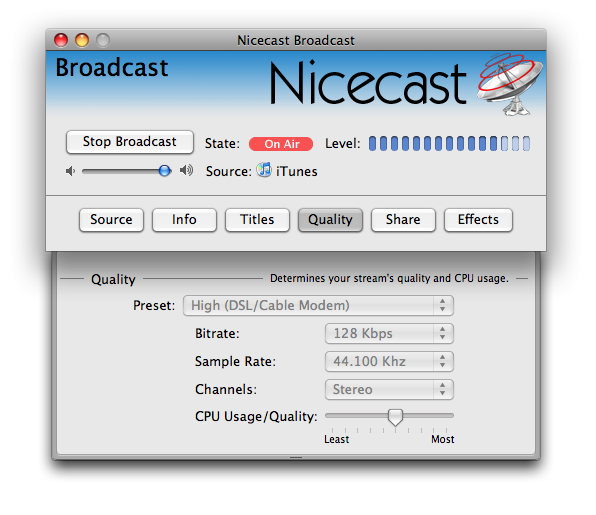 Nicecast for mac is the easiest way to broadcast music for Mac OS X. Broadcast to the world, or just across your house. Nicecast can help you create your own Internet Radio station or allow you to listen to your iTunes Music Library from anywhere in the world! You can listen to your music from anywhere in the world, on Mac or PC, or even a Linux machine. All you need is a streaming MP3 Player and you'll be grooving to your favorites all the time. Nicecast for mac is the easiest way to broadcast music from OS X. ...... All you need is a streaming MP3 Player and you'll be grooving to your favorites all the time. You can use an Audio Player like iTunes to DJ hour after hour of your favorite music or just to let your friends hear that new song you've been working on. The included VoiceOver effect lets you insert radio-style commentary, right Between songs. Radio on your Macintosh has never been this easy or this much fun. Broadcast events live or host a call-in show - anything you can plug into your Mac can also be broadcast out. Want to broadcast your band's next gig? Just plug in a cable from the mixer to your laptop, and run Nicecast. Nicecast is perfect for every type of audio broadcasting - try it out today. Qweas is providing links to Nicecast for mac 1.10.0 as a courtesy, and makes no representations regarding Nicecast for mac or any other applications or any information related thereto. Any questions, complaints or claims regarding this application Nicecast for mac 1.10.0 must be directed to the appropriate software vendor. You may click the publisher link of Nicecast for mac on the top of this page to get more details about the vendor.